The most powerful switch hitter of all time, Mantle is regarded as one of baseball's greatest players. His long home runs are legendary: one travelling out of Tiger Stadium an estimated 643 feet and another hit an estimated 565 feet out of Griffith Stadium. Playing for the Yankees during their longest dynasty years, Mantle set a number of World Series career records: home runs (18), runs scored (42), and runs-batted-in (40). 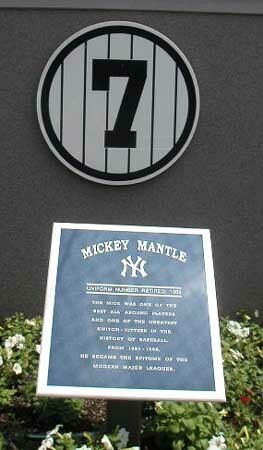 His number 7 was retired and immortalized in Yankee Stadium's Memorial Park.